Wisdom of Life. : You get your wishes on Xmas. 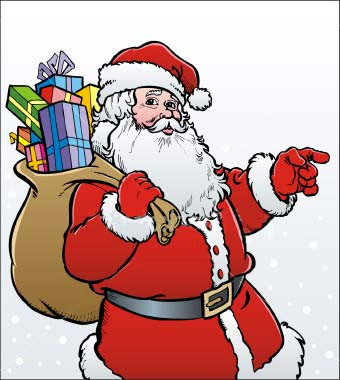 At the eve of Xmas, Santa Clause would be bringing all the gifts of joy to the world. To the little kids, they be happy and excited to see toys and games. I asked my secretary who has been working with me for the past 18 years, what she wanted when Santa arrives. She said "Boss, there is no Santa Clause lah! Its only a child's mystic and imagination. But i will be very happy if i receive my salary together will a fat bonus." I told her, "Yes! Santa would fulfill your dreams!" I spoke to Ah Fei what he wanted for the presents tonite. He wishes Wati would love and marry him next year. I called Ong staying in JB what he wants. Spiritually he wants to have Peace. I am sure Santa would understand. The wife who was besides him asked for good health. Yee Fun who complained of frequent back pain would be happy if Santa could come with a cure for her discomfort. Zarina still single hope to marry sooner, wished to have a love from Santa. Peng who is so engrossed to qualify for her Company oversea trip by end of this year, demanded more sales by this month.. "Santa! please let me have the Paris trip." While writing this page, i seek the Almighty Universe to grant all the wishes and dreams to all these friends who are so closed to me. Though Santa Clause might be a mere mystic to our physically world, his name has the magic to bring us the gifts of love and happiness. Santa would be sliding down your chimney on the eve of Christmas with the presents you would wish for. May this Christmas brings joy and peace to this violent earth of ours. May this Christmas brings us happiness. May this Christmas brings us love. Ah!!! I almost forgotten for myself. "Santa, please wrap up a gift with my little darling in it. Coz she is very important to me." Meanwhile i wish all my readers, A Merry Xmas & A Happy New Year ahead. Wish you have a great Christmas with your Darling. Thanks! Thanks! Thanks! The thoughtfulness of you makes life worth living. Have fun with this holiday festival.